Haitian Cholera Strain Spreads To Mexico : Shots - Health News A cholera outbreak in Mexico has been traced to the same strain that first appeared in Haiti three years ago. It has appeared in the Dominican Republic and Cuba, too. So far nearly 9,000 people have died in the four countries, and health authorities think it will spread farther in the Americas. A nurse treats a cholera patient at the Juan Pablo Pina Hospital in San Cristobal, Dominican Republic, in August. Health officials say that the strain of cholera circulating in the country— the same one that first appeared in Haiti three years ago — has also caused outbreaks in Cuba and now Mexico. A South Asian strain of cholera that was introduced into Haiti three years ago this month has now spread to this continent's mainland. Mexico is the fourth Western Hemisphere country to experience the cholera outbreak. It's a disease that's very hard to stamp out once it gets into an area with poor water and sanitation. Mexican health officials first picked up on the problem Sept. 9, through routine surveillance of hospital cases of severe diarrhea. Since then there have been 171 reported cases in Mexico City and states to the north and east. One victim has died. Dr. Jon Andrus, deputy director of the Pan American Health Organization, says it was all but inevitable that cholera would spread beyond the Caribbean. "It was always a major concern that it would be exported to other countries, as has recently happened in Mexico," he tells Shots. Since it was introduced into Haiti — very likely by United Nations peacekeeping troops from Nepal who were billeted at a camp with poor sanitary facilities — cholera has sickened 715,000 people in Haiti and the Dominican Republic (which share the island of Hispaniola) and Cuba. Nearly 9,000 have died. Andrus fully expects it will spread further. "We are advocating throughout the region for countries to be on their guard," he says. Cholera is thought to have invaded Cuba via infected health personnel who work in Haiti and travel back and forth. Cuba has reported nearly 700 cholera cases and three deaths, although many are skeptical that that nation is fully reporting the extent of its outbreak. Andrus says vacationers visiting Cuba — who probably got cholera from contaminated food — have exported the disease to Chile, Venezuela, Italy, Germany and Holland. So far those cases haven't touched off outbreaks. But as the Mexican epidemic shows, it can easily happen if an imported case contaminates water or food in an area with poor sanitation. "You have those situations throughout Latin America," he notes. "We are the region of the greatest disparities." 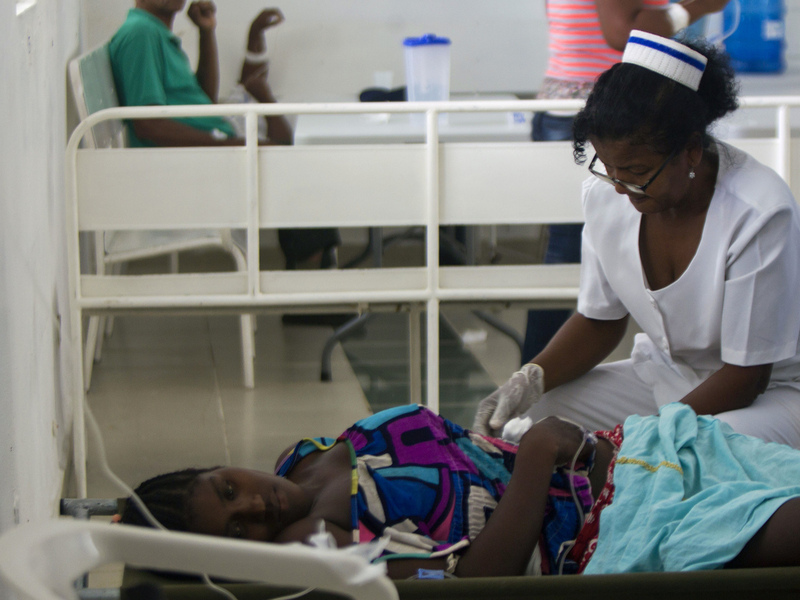 The last time the Americas saw a major cholera epidemic was 22 years ago. It was allegedly brought by a ship that discharged its bilge water in a Peruvian port. The disease spread all the way up the continent, sickening more than 1 million people and killing 10,000 or so, until it hit the U.S.-Mexican border. There it was stopped by modern water- and sewage-treatment facilities in the United States. Andrus says PAHO is worried this latest epidemic will have a similar impact. "It's really, for us, a defining moment," he says. "To what extent are we concerned about spread? Well, it's really a regional threat and now a global threat to health." It took Mexico more than 10 years to bring its last cholera epidemic under control. This time sanitary conditions are better, so it might not take that long. But Andrus says it won't be easy to stamp out. "It won't be 10 years, [but] it won't be days or weeks," he says. Dr. Maureen Birmingham, PAHO's representative in Mexico, writes in an email to NPR that authorities there are monitoring the population for spread of cholera and focusing on prompt treatment of affected people, along with providing clean water and sanitary facilities to vulnerable communities. Birmingham says Mexico is not currently considering use of an oral cholera vaccine that was approved last year by the World Health Organization for use in outbreaks. The WHO has reportedly stockpiled about 1 million doses of the vaccine, which costs $1.85 a dose and requires two doses. In any case, the cholera vaccine is a stopgap measure. All public health authorities agree the only real solution is clean water and adequate sewage treatment. And many of them hope the current outbreak will stimulate major efforts to bring clean water and sanitation to the hemisphere's poorest communities. "Cholera's one of those infections that catches attention in a way that few infections do — plague, Ebola, pandemic influenza, cholera," says Dr. Edward Ryan of the Massachusetts General Hospital. "It's one of those ones that everybody sort of sits up straight for. It is one of the ones that tests the system." But Brian Concannon of the Institute for Justice and Democracy in Haiti points out that the United Nations has found only 10 percent of the $2.4 billion it says it needs to rid Haiti and the Dominican Republic of cholera over the next 10 years. "Right now 10 percent of the funding is probably not enough even to get started," Concannon tells Shots. "And so the U.N. needs to feel some serious pressure to do a more serious job of raising the money." Concannon's group is trying to do just that. Earlier this month it filed suit against the U.N. in U.S. District Court for its alleged role in introducing cholera to Haiti. Filed on behalf of cholera victims, the action seeks, among other things, to force the U.N. to raise the money to stamp out cholera on Hispaniola.